Click here to go back to Ashrei . Click here to go forward to the Chatzi Kaddish. Yishtabach (literally, "shall be praised") is the closing blessing of P'sukei D'zimra, the collection of psalms and other poetry that are recited in the synagogue before the Bar'chu (the call to prayer). The blessing marks the end of the "spiritual warmup" section of the service, right before the congregation comes together to begin the communal prayers of the Sh'ma and the T'filah. Some traditional commentators noticed that the long closing (chatimah) of this blessing contains fifteen words following the formula, "Baruch Atah Adonai." The number fifteen is closely associated with God's Name because it is the numerical value of "Yah" (as in, "Hallelu -Yah," which means, "Praise Yah"). 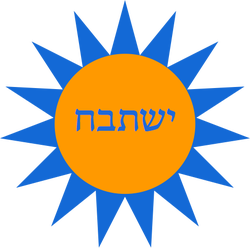 The letter Yud (י) has the value of ten, and the letter Hey (ה) has the value of five. The numerical reference to God's Name reminds us that when we pray, God's Name should be at the center of our attention. We focus on the idea that God is revealed to us in many ways and we have many ways in life to express our gratitude to God. As we complete our preparation for the morning service, we try to put God at the center of our thoughts and remember the many ways in which God touches our lives.